Analytical Armadillo: Discussion - Jo Tantum, Why Won't You Share Your Evidence? 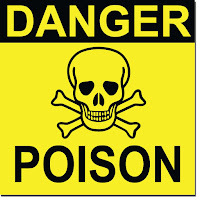 Discussion - Jo Tantum, Why Won't You Share Your Evidence? 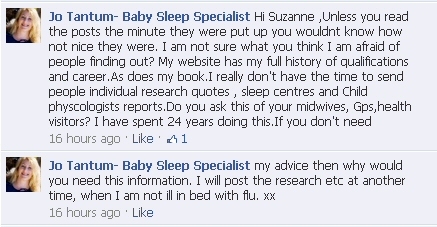 Jo Tantum, for those who haven't heard of her - spoke recently at The Baby Show as their "sleep specialist". Her webpage claims she is an "expert in all aspects of baby care", so I was naturally curious about what she had to say. I was even more interested after watching this clip by Baby Calm of Jo's presentation at The Baby Show, and reading her comments that followed. 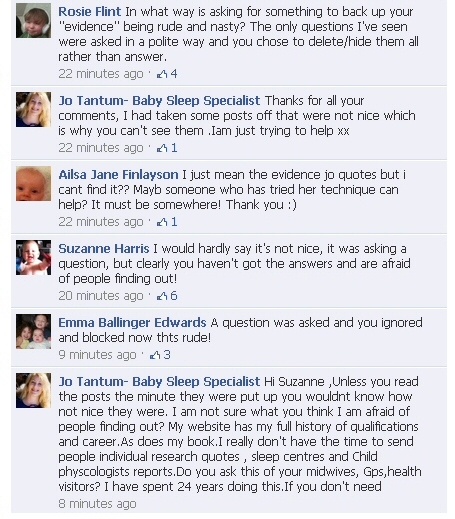 "Research shows that they should be getting enough nutrition in the daytime so they don’t need feeding at night"
" Jo's advice is tried, tested and backed up with robust research"
Intrigued I replied to Jo on the Baby Calm discussion above - you can see my comment is still there. But no reply. Next I posted on her Facebook wall, politely mentioning I had left a reply on the Baby Calm blog, but was also posting there in case it had been missed. I again asked if she could please let me know the details of the studies she is referring to. This message received over 50 Facebook likes - yet when I returned it had been deleted and I had been banned. All comments had been removed except one, to which Jo had replied - it's probably just easier for me to show you, and the comments that followed. 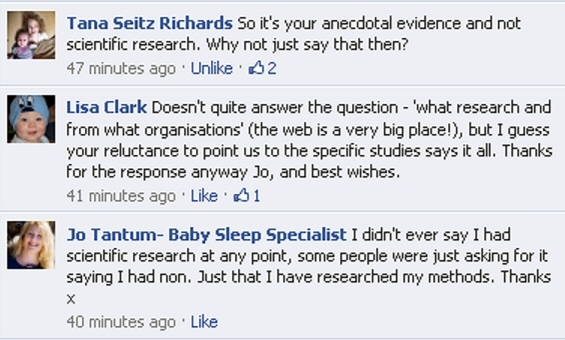 So, in her reply - second comment down, Jo clarifies she has research from around the World. Before going on to share er none of it. But then the Milk Matters post was deleted too. And then this Milk Matters post was deleted too and that account banned. It's even more confusing given on her "information" tab on Facebook, Jo Tantum claims to have all the answers - yet when asked by lots of mums what evidence she is basing her "research shows", we can't get a reply to a simple question? Only censored? This isn't even about agreeing or disagreeing with Jo Tantum's techniques - far from it, nor is it about what Jo dreamed of doing when she was 14! If you sell your services and an expert, and you claim your views are evidence based - why nowhere on Jo's site are there any research links, and why is every request for them no matter how polite refused? When parents complained their posts had been removed, Jo claimed she had deleted them as they were "not nice"
I don't see how any of the polite requests for information could be construed as "not nice" - I can't see how it is anything other than perfectly reasonable. One Tantum fan claimed mums asking for evidence was "internet bullying" - which baffled me even more! I do know pulling the "It's really mean of you to ask little old me when I'm just trying to help" card is a rather naff cop out technique, purely because she has been asked a perfectly reasonable question by other equally polite parents.. It seems we're not going to get an answer as Jo's last quote claims she doesn't have time. I would argue that the ongoing censorship of her Facebook wall must take significantly longer than copying and posting references you claim your work is based upon. PS having just read some rather eye brow raising breastfeeding advice, I would also like to ask what qualifications Jo Tantum has in the field of breastfeeding - if anyone knows, please do let me know! So Jo does confirm she will post this information. Which rather begs the question as to why I couldn't just get this reply to my very first question? ie - Sure when I feel better I will share? Why was I deleted and banned for asking? From the comments on Facebook rather a lot of mums that asked for the evidence quoted seem to have been removed from Jo's Facebook page, which seems a rather hostile way to deal with what started out as a polite request for information? Disappointing as the stats Jo quoted on her website entry seemed so definite, I was looking forward to getting my teeth into a good robust research paper - unfortunately, for me anecdotal doesn't often cut it. Given that she said her facebook page was a place to help sleep-deprived parents who come to her for help, I posted a question about my dd who still wakes 2-5 times a night at 17 months. I gave a quick background and asked for advice, or for pointers to any research/studies that might help. I was very polite. My comment was deleted. The woman is clearly an idiot, as if she had any sense the least she would have done is tried to flog me a book/consultation. i have never heard of this person, but that is NUTTY! it isn't like she has to answer ever single person she just needs to do it once and post a link so people can see it. I have some news for her: Yes! I do ask for the supporting evidence and specifics from my midwives and any others involved in my care or care for my children. "...I really don't have time to send people individual research quotes, sleep centres and child psychologist reports. Do you ask this of your midwives, GPs, Health visitors?..." The answer Mrs. Tatum is a resounding YES!! Of course I ask for references for the information my doctor or midwives or anyone provides. Silly woman. OMG it is another 'sleep specialist' with no training or evidence other then her own personal feelings that is taking advantage of nervous parents. Does she get together with Tizzy Hall on holiday? ugg! far out what a dumb arse? Answer the friggin question? Where is your research? She is a carbon copy of Tizzie Hall another one who sprouts research and no i dont do CC but I get you sit out of a room and time but its based a the type of cry so that's different.....WHY ARE PEOPLE being so conned by these awful people and books! parental attention as a reinforcer. " BUT BUT BUT they are behavioural techniques, not in any sense attachment-focused, indeed don't even nod to child-centred parenting approaches. No discussion of the notion of learned helplessness, any longitudinal results, effect on attachment relationship etc etc, no mention of raised cortisol etc. So, I suppose if you use their self-defined (narrow) parameters for success, then there is an evidence base for CC. Jo claims she doesn't promote/support CIO/CC? "There have been very few studies (5) that have conducted headto-head comparisons between different behavioral treatments. Although these few studies suggest that there may be comparative differences in degree and rapidity of treatment response, there is currently not enough evidence to recommend the use of 1 treatment over another"
be made regarding the relative superiority of any combination vs. single therapies. no standardized research criteria for defining these sleep problems in the pediatric population. Finally, because of the nature of sleep complaints in young children, outcomes may include parameters related not only to daytime functioning in the child, but to parental variables (e.g., mental health, marital satisfaction) as well. The paper doesn't provide evidence for Jo's claims that infants can sleep x hours at x age/weight? Which is what I was asking for? Lee-Chiong, and Pancer have indicated no ﬁnancial conﬂicts of interest.